Leafing through the pages of this issue, we can look at the new year renewing the trust that has always fed this editorial project. The journey shared with you, our readers, looks at a clear horizon; leaving home, the sails set and, for the first time, the route is accompanied by a new sound. On the pages you’ll leaf through we talk about music, the one illustrated by Tanino Liberatore for the cover album of one of the coolest Italian bands around the world: Sir Bob Cornelius Rifo aka The Bloody Beetroots and his “The Great Electronic Swindle”, released on last October 20. And then, the art director of Il Mucchio Selvaggio, Francesca Pignataro, tells us, ranging from jazz and metal to The Beatles, how drawing marked the visual culture on vinyl records. 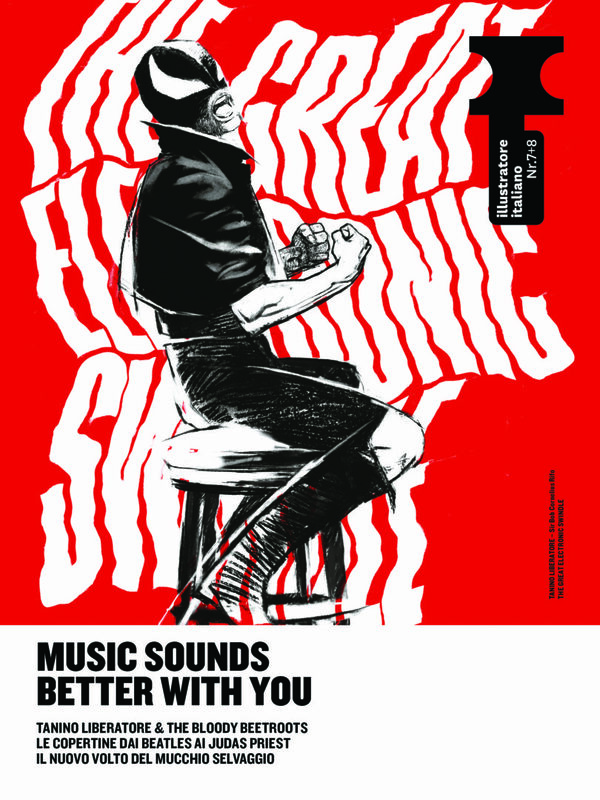 The magazine which she entirely re-designed is lively and has talked about music since 1977; it has a new masthead and it’s very international, thanks to the typography designed by Sunday Büro, aka Valentina Casali and Marco Goran Romano. It’s innovative and you feel the influence of the masters and from Martoz pairing with Giorgio Poi. But a double issue leaves space for a reflection started previously. What does self-production mean today? What are the fields that experiment the most and benefit from it? What if they were the indie of videogames? The last edition of Lucca Comics has just come to an end and people say it was a breath of fresh air. We already started to tell you what self-advertising really means, with a creation strictly connected to experience. Do you think Depero’s Bolted book can be used as an example? That’s what drawing is. An alchemy of skills, with eyes wide open, always curious and looking for the unknown. A story to tell.